During the training process, dogs are presented with urine or breath samples from patients with cancer, without cancer and with other diseases. 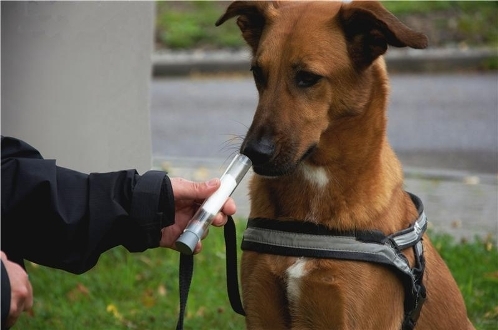 A clicker is used when the dogs sniff cancer samples so they learn to target the odor of volatile organic compounds (VOCs) that are linked to cancer. 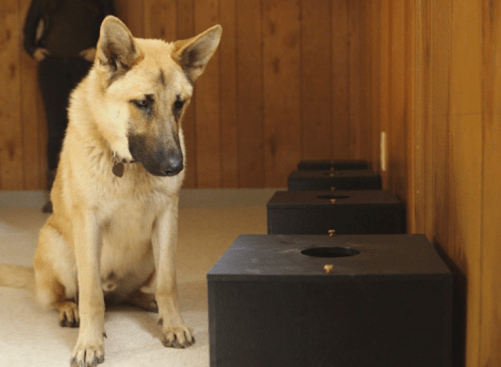 The dogs are trained to signal the presence of VOCs by pawing, barking or sitting by the sample, and are rewarded when they do so. In a 2003 study, trained dogs detected breast cancer in breath samples with 98 percent accuracy. The samples were collected by having volunteers blow into plastic tubes that were filled with polypropylene wool, which preserves the breath’s scent. Even more amazing are the cases of untrained pet dogs who successfully sniffed out their dog moms’ breast cancer. There have been at least three reported cases over the past few years, all of them in the UK. In December 2014, Josie Conlan’s rescued Border Collie, Ted, began nuzzling a lump on her breast and crying, according to Gazette Live. The lump turned out to be cancerous. In April 2013 a Pug named Flo did the same thing for her dog mom, Marian Cooper. And in July 2012, the BBC reported that Penny, a Cavalier King Charles Spaniel, sniffed out Sharon Rawlinson’s breast cancer. Trained dogs in a 2011 study, conducted by the Schillerhoehe Hospital in Germany, sniffed out lung cancer in breath samples with 71 percent accuracy, ScienceDaily reported. The samples were from lung cancer patients, chronic obstructive pulmonary disease (COPD) patients and healthy volunteers. “In the breath of patients with lung cancer, there are likely to be different chemicals to normal breath samples and the dogs’ keen sense of smell can detect this difference at an early stage of the disease,” Thorsten Walles, author of the study, said in a press release. A German Shepherd named Tsunami detected ovarian cancer in tissue samples with 90 percent accuracy during a 2014 study by the University of Pennsylvania. Tsunami and two other dogs were trained using tissue samples from both cancerous ovaries and ovaries with benign disease, according to Bloomberg Business. Researchers are hoping sniffer dogs can someday be replaced with sensors that can detect cancerous tissue 1/100,000th the thickness of a sheet of paper. 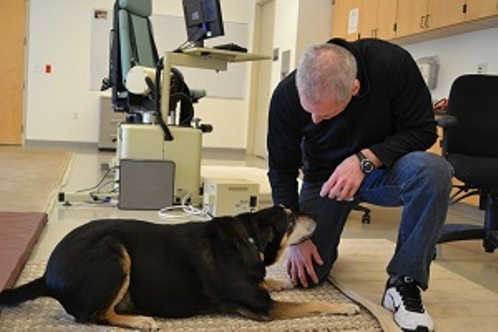 Two specially trained dogs in a 2014 study were able to detect prostate cancer in urine samples with 98 percent accuracy, Medical News Today reported. “These data show analysis of volatile organic compounds in urine is a promising approach to cancer detection,” said Dr. Brian Stork, a urologist from Grand Haven, Mich., who conducted a presentation of the findings at the annual American Urological Association conference. In a recent study by the University of Arkansas for Medical Sciences (UAMS), Frankie, a scent-trained, rescued German Shepherd mix, was able to sniff out thyroid cancer in 30 of 34 urine samples with 88 percent accuracy. He was just slightly less accurate than a standard thyroid biopsy — an invasive procedure using a needle.